My youngest — my youngest! — graduated from elementary school last week, and the impact of that hit me like a ton of bricks. I am the parent of TWO middle-schoolers. Ryan is two years away from entering high school. Don’t get me started on that particular bit of terror. 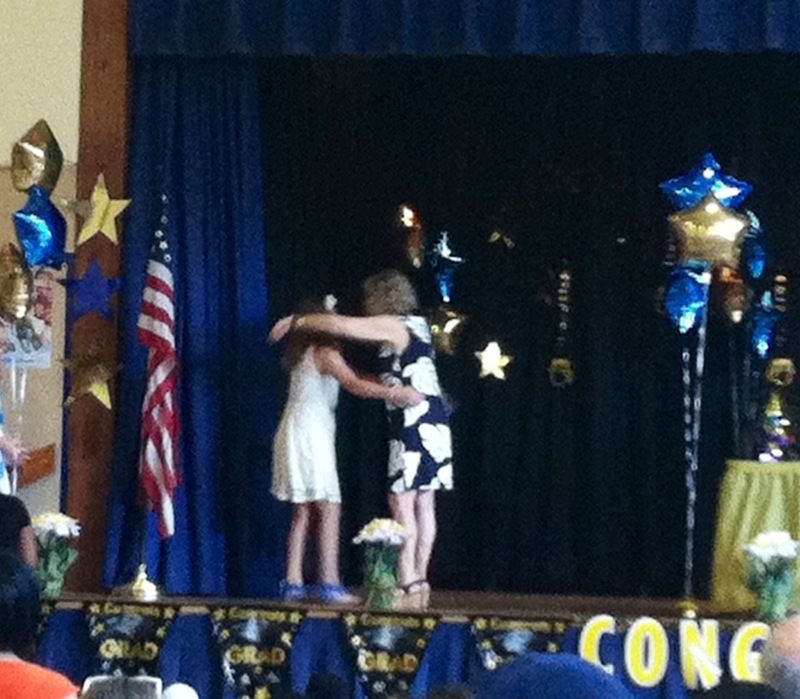 Ryan’s graduation from the same elementary school last year was an emotional event. These were teachers and aides that embraced him, encouraged him, and enveloped him with yes, love, to create an environment in which he could be successful. Sure, there were rocky moments, but we always knew the people who worked with our son cared deeply about him and wanted nothing but the best for him. From the school secretary, who from his first day visiting as a nervous five-year old promised to act as his mother-warrior, and NEVER fell short of that promise, to the crossing guard who knew him, and every other student — and their parents — by name. All of them created an environment where two terrified parents were confident that their son, with all his challenges, was being well looked after. And yet, somehow, this year was even more difficult. It was the finality of saying goodbye to the school that had been so good to our family that caused me to get so upset. As I’ve gotten older I have a terrible time with finality. Whether it’s the end of a hockey season or a school year, they all cause the tears to flow like waterworks. At least last year we knew we had one more year to visit with the teachers, administrators, and aides that had played such a big role in Ryan’s success. This year, we were truly saying goodbye, and it was painful. We sought out and thanked, one last time, teachers from earlier grades. Some of them had only one of our kids, and a couple had them both. Veronica spoke eloquently to them of the impact they had in our lives. There were long hugs and tearful goodbyes. But it wasn’t just the parents that were crying. The school has a wonderful tradition for the graduating fifth-graders: They line up and march through the various wings of the school, tracing their route back through the years. Finally, they emerge from the kindergarten door — leaving by the door from which they first entered — as all the parents line up to cheer them on. It’s called the “clap out,” and I get misty-eyed just thinking about it. Riley emerged from the kindergarten doors sobbing, as did several of her classmates. Everywhere I looked, I saw crying students, parents, and teachers — and not just of fifth-graders. Riley spent several minutes seeking out and visiting with “her” first-graders — the class for which she had served as safety patrol. Many of those kids were sobbing as well. What does it say about a school that a lot of the kids emerge from the last day not celebrating wildly, but bawling their eyes out? What does it say that their teachers, offering long embraces while they dab their eyes, do the same? I don’t know how we ended up so lucky to land at this school, in this district, that takes the meaning of education and SPECIAL education, so obviously to heart. We live in a middle class town, a community that is ethnically and socio-economically diverse in every sense of the word. Many might look at the demographics of our town and assume that a better education could be found in the more affluent suburbs that sit nearby. I have said here before that I am not a person of faith, at least not in the traditional sense. Religion did not play any role in my upbringing and does not play a role in my children’s lives. And yet, I believe that certain things happen for a reason, whether it’s a happy accident of the NHL, college football, and school calendars, or the school district we ended up in. We bought our house before we had children. We choose it because it had central air conditioning and sat on a quiet street. Also because it was a house we could obtain without entering a bidding war in what was a hot real-estate market. It was going to be our starter home. Three to five years, we told ourselves, and then we’d take our young kids and head deeper into suburbia for a larger house and better schools. Well, we’re about to hit 14 years in this house, and the main reason we stayed is because of the services that Ryan received. We happened to end up in a district that truly embraces special education. Maybe that wasn’t an accident. There is no way for us to put a dollar figure on the services our son received, and on the environment that was created to allow him to be successful. Once we saw how our son was treated, we quickly decided we wouldn’t be going anywhere until both our kids were at least out of elementary school. Maybe that’s what bothered me so much about Riley’s graduation. We’ve reached that milestone, and though we have no plans to leave immediately, one of the anchors that has kept us where we are has been raised. That makes the future somewhat cloudy. I do not like the unknown. I do not like finality. Hence, all the tears. Before I end this rambling post, I need to say a few words about my younger child, in the hopes that she will read them one day. Riley, you are my shining star. I could not imagine being prouder of you. At your graduation ceremony we watched you win a bushel full of acknowledgements, ones that recognized mind (high achievement in academics), body (Presidential physical fitness) and community (service as a peer mediator and the safety patrol of the year). But as proud as I am of all of that — and I am plenty proud — it was the words of your teachers that left me bursting. One after the other, your teachers told us that you were one of the finest PEOPLE they had ever taught. Your current teacher told us how you constantly looked out for others and cared about everyone. How when she gave the class the opportunity to rearrange desks for the final weeks of school, you noticed that nobody wanted to sit with the autistic student and you quickly invited him to join your group. You keep a picture of the two of you as the wallpaper on your phone. You care. You get it. You are a good person. No, you are wonderful person, Riley. Your brother, though I know he sometimes drives you nuts and you sometimes fight like cats and dogs, is lucky to have you as a sister. You have accepted the challenges that your brother’s diagnosis has placed before our family, and you have used them as motivation to become a kinder, gentler, more caring, BETTER person. I love you so very much and am only upset because I wish I could slow down the rapid pace at which you are growing up. You leave an impact on every life you touch, and that is an incredible gift. I am honored to be your father. And now I am bawling. Not good when I am about to head into a meeting. You should be very proud of the job you and Veronica are doing of raising your children. They sound like awesome people. Thank you. I like to think so too! Riley is an amazing girl. She’s going to do great things…we need more people like her in the world. Congrats to her on her graduation…onto bigger and better experiences!! She is an amazing kid, and am I very proud of her. But it’s been a couple of weeks, and I’m still not over it!